As a die-hard fan of the music of the Beatles, I was always aware of the women in their lives, but didn’t really know much about them. Sure, I knew that Yoko Ono came from a family of bankers and allegedly broke up the band (not really true), and that Linda Eastman was a photographer with ties to the Kodak fortune (that connection is actually not true either). I was also aware of Pat Harrison Clapton (the one who left her husband George for his best friend Eric) and Olivia Arias (Harrison’s second wife), but I didn’t really pay much attention to them- I focused on the music I loved and left the musicians’ personal lives for others to obsess about. Of course I was saddened when I heard of Linda’s untimely passing in 1998. At the time, I saw the McCartney marriage as a model of grounded celebrity union. They lived an almost scandal-free life together and seemed to have successfully raised four ‘normal’ kids who never appeared on tabloids save when daughter Stella McCartney designed some starlet’s gown. And they were both strong advocates of animal rights and of course, vegetarianism – Linda even launched her own line of meat-free products and wrote several cookbooks with simple everyday recipes that adapt well-known dishes like Hungarian goulash and deep dish pie while introducing international vegetarian entrees from India, Thailand, Brazil and other countries. 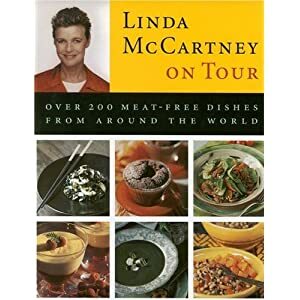 I came across Linda McCartney On Tour at a bookstore in downtown Manhattan around the time I relocated here in 2000. By the picture on the jacket, I was aware it was published after she was going through remission, since her hair is short and darker than it was before. It is a lovely tome that has more than 200 recipes – some of which I have used repeatedly. Not all her adaptations work. For instance, puttanesca sauce without the anchovies feel like there is something missing no matter how much more pepper and garlic you add, and her take on Brazilian black bean soup (originally cooked with meaty bones for flavor) is kind of bland. But when they come out right it is a feast for the taste buds. Among my favorites is the aforementioned goulash (made with vegetarian burgers), which has a great kick thanks to the paprika and the varied spices. I’ve also prepared the Cajun rice salad and many of her European and Asian (vegetable kidchi having become a mainstay) recipes, which were all devoured eagerly over our Sunday dinners at home either just it being the two of us or having guests over. I take your point, Did you know that nearly every Congressperson by the time of their second or third term in office is a multi-millionaire, no matter what status they were going in. Have you ever considered why that is? Well, not long ago, an acquaintance from North Carolina who has been tracking these things for years explained this to me. No, I wasn’t surprised, but it reminded me the problems we have in our great republic.